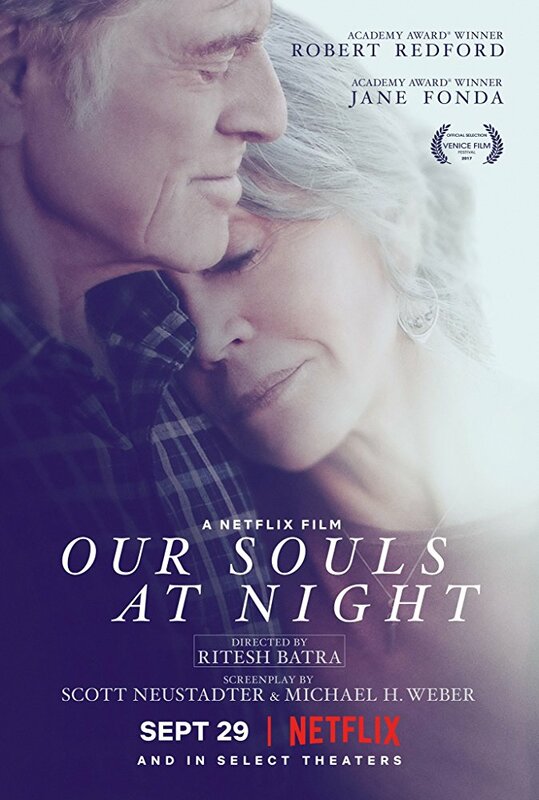 Ritesh Batra’s “Our Souls at Night” is the second movie after “Paris Can Wait” (2016, by Eleanor Coppola) that delighted me to the core. This heart-warming story, evolving around two people, is truly inspiring in the way the protagonists see the time, the life and even the love itself. That’s something the younger generation should learn from elders. And the nights… The nights, that the protagonists spend together, are the best I’ve seen in any film. Robert Redford and Jane Fonda are co-starring in “Our Souls at Night” – a beautiful story with endless conversations, meaningful discussions that, I am sure, many of you will find incredibly touching. The screenplay is co-written by three writers – Kent Haruf, Scott Neustadter, and Michael H. Weber. I believe that the film has benefited a lot from this collaboration, where it is obvious how much thought has been put into each scene. The story follows Louis Waters (Robert Redford) and Addie Moore (Jane Fonda), two neighbours who, despite living next to one another for years, do not have much interaction. Their lives change when Addie approaches Louis in an attempt to initiate a connection. Being a widow and a widower, their nights become more soulful than they used to be the day before. The film begins with Addie knocking on Louis’ door with her strange proposal. She tells him that her feet are cold at night and that she, as well as him, might need a company to talk through the night until they fall asleep. Louis finds it odd at first but after giving a second thought, he starts to like the idea. As the neighbours start learning about each other, they soon become good friends who start to appreciate the innocent intimacy surrounding their night-long conversations. As a viewer, you will have to sit tight and listen to what the two elderly people think about life, past, present, and future. And we see why they want their nights to be filled not with any company, but a meaningful one. The movie is filled with a warm and friendly atmosphere. I believe, the viewer needs to get into a certain mindset to enjoy being directed from one scene to another, and see the real reason why Addie came up with her suggestion, and why Louis accepted it. Perhaps, this film is to help us be more prepared for senior life to come, and learn not to take our youthful lives for granted. One day, it will be gone, the same way it’s gone for Addie and Louis. The two characters have something that many people lack in our days – sincerity, recognizing the power of time, and understanding that aging wisely is the best thing that can happen to a person. In conclusion, “Our Souls at Night” is a charming film made with heart. It’s about an elder soul that shares the same needs as the younger one – it searches for peace, connection, does not hesitate when taking chances and does not miss the opportunities that come along. Jane Fonda and Robert Redford are adorable together. Their performance is simple, educational, and in a way, thought-provoking – reminding us all that the most important thing we all have is each other, which is something that should not be undermined but cherished every second we live our lives.